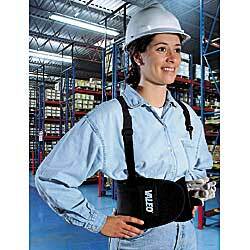 Five rubberized back supports keep belt in place while lifting and bending. Heavy-duty breathable elastic knit wraps around waist and secures with Velcro®closure. Quick-release detachable straps with two-stage hook and loop closure adjust to fit individual user. 9" wide. Washable. SPECIFY SIZE: B - Medium (32"37"), C - Large (35"40"), D - X-large (40"45"). IN STOCK. ZF-2255B Medium	 Wt. 1.5 lbs. ZF-2255C Large	 Wt. 1.5 lbs. ZF-2255D X-large	 Wt. 1.5 lbs.